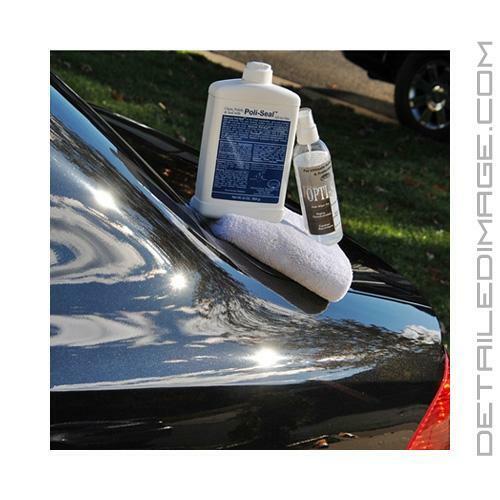 This is an absolutely amazing and revolutionary product that makes protecting and shining your paint unbelievably easy. Opti-Seal is an ultra concentrated spray on sealant that dries clear and requires no removal of excess product. Yes you read that correct NO removal is needed at all. Simply spray on a very fine mist, spread it nice and thin with the free foam applicator supplied to you with very light pressure. The polymers will instantly start to cross link and form an extremely tight bond with your clear coat. After that you just have to walk away because you are all done, no additional buffing or removal is necessary. The Opti-Seal will dry clear and leave a brilliant shine on any color paint. This state of the art sealant provides long term protection, so don't mistake it for a product that just provides a quick shine. 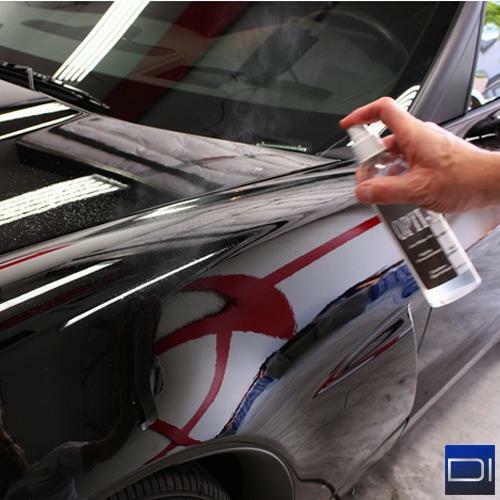 It can protect the paint for months with no additional protection needed. If desired you can layer a wax over it but it's not necessary. 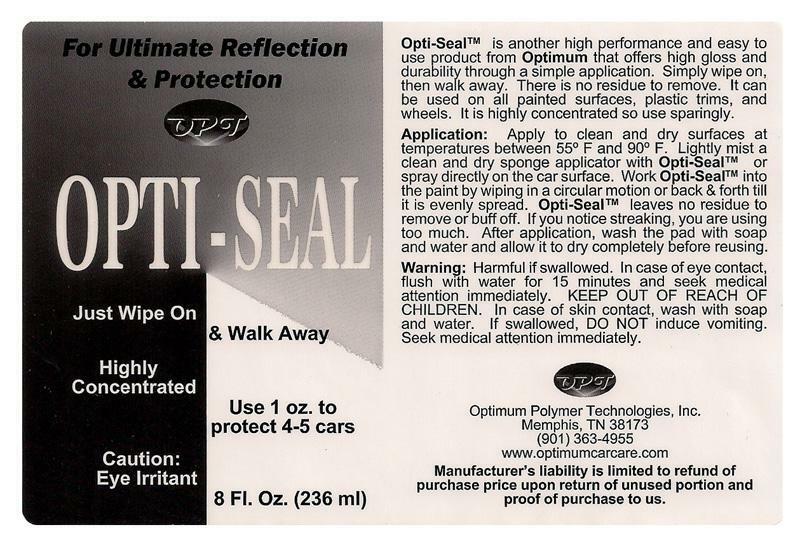 Whether you use it alone or with your favorite wax the Opti-Seal will protect against UV rays, road grime, dirt, brake dust, industrial fall out and more. Best of all is this product provides tremendous value as you many only need about .25 ounces per coat! We also highly recommend it on the glass, wheels, headlights, etc. 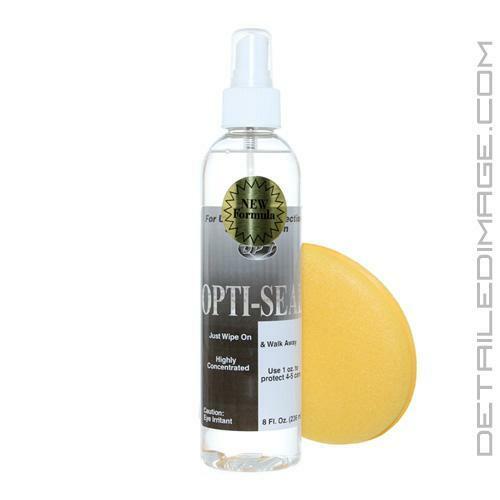 Try the Opti-Seal today and get one of the most effective and easiest to use detailing products ever created. Opti-Seal is a true paint sealant with no cleaning properties. It provides a crystal clear polymer barrier between the finish and the harsh elements, and best of all it easily goes on in minutes. Opti-Seal is hyper-concentrated, so a little bit goes a long way! Just one ounce will seal and protect 4 to 5 cars. It comes with an 8 oz. bottle and a foam applicator pad. Once completed, you will be left with a beautiful finish that will provide months of protection. Every great now and then a breakthrough detailing product comes along that sets the new standard with its performance, ease of use, value, or its versatility. For Optimum Opti-Seal spray sealant, it hit the mark in every single category! Opti-Seal is another high performance and easy to use product from Optimum that offers high gloss and durability though a simple application. Simply wipe on, then walk away. There is no residue to remove. It can be used on all painted surfaces, plastic trims, and wheels. It is highly concentrated so use sparingly. Applications: Apply to clean and dry surfaces at temperatures between 55°F and 90°F. Lightly mist a clean and dry sponge applicator with Opti-Seal or spray directly on the car surface. Work Opti-Seal into the paint by wiping in a circular motion or back & forth till it is evenly spread. Opti-Seal leaves no residue to remove or buff off. If you notice streaking, you are using too much. After application, wash the pad with soap and water and allow it to dry completely before reusing. Worked really well for a while. My long commutes in the winter tend to leave a lot of contamination on the lower half of my car. It works pretty well, repels water, etc. off the top half of my car still, but I'll need to do a better wash with either the Power Clean that I bought or maybe just a quick wipe down with some ONR. My initial application was done by spraying a little on a microfiber drying towel after an ONR wash. Then I went over it again with more Opti-Seal using a foam applicator, letting it dry for a minute or so and then wiping it off. Gave my new CX-5 a nice shine, and I plan to continue using it when I detail my car.